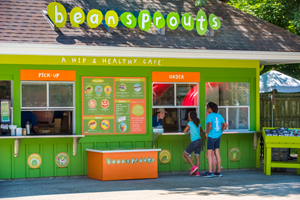 Through the Milwaukee County Zoo’s new partnership with Service Systems Associates (SSA), the Zoo is excited and proud to welcome Bean Sprouts as a stand-alone walk-up food location in the Zoo’s Northwestern Mutual Family Farm. Bean Sprouts is a healthy food option for families who are looking for a more nutritious, feel-good meal. With vegan, nut-free, gluten-free, egg-free, soy-free options and more, Bean Sprouts also provides new offerings for those with food allergies. Bean Sprouts is marking its tenth anniversary, tenth location and first location within a zoo here at the Milwaukee County Zoo. The “hip and healthy café,” serving at several family destinations across the United States, thrives on the four pillars of health, positivity, innovation and playfulness. The two founders of Bean Sprouts, Shannon “Peacasso” Seip and business partner Kelly “Pea Brain” Parthen, met at the University of Wisconsin–Madison, making the arrival of Bean Sprouts at the Zoo a coming home of sorts for the two entrepreneurs. Bean Sprouts addresses the growing need for healthy food choices in family-friendly venues with menus featuring nutritious and mostly organic food with no artificial flavors, colors or preservatives. Lower counters allow for kids to choose their own meal from the Imaginibbles kids’ menu. Signature Imaginibbles include Grilledzilla, a gooey grilled cheese with veggies, Do-Re-For-Me, a sunflower butter and organic jam sandwich, voted best kids’ meal in the U.S. by the National Restaurant Association and Kids LiveWell, and more. Bean Sprouts is allergy-friendly and can almost always accommodate meals to suit kids and adults with food allergies. For more information on Bean Sprouts’ menu and an allergen reference guide, click here. 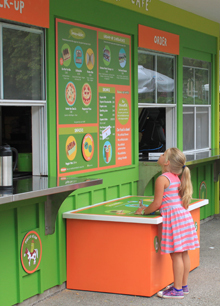 Bean Sprouts is now officially open at the Milwaukee County Zoo, and is ready to spark children’s appetites with delicious and nourishing food, and delight grown-ups with a happier mealtime. Bean Sprouts is open seasonally, Memorial Day through Labor Day, and during spring and fall when weather permits. For more information on Bean Sprouts, call the Zoo at 414.256.5466.